Between 1820 and 1840 the British sold a lot of Opium in China. Compared with the total size of the British Empire's economy, how big was the Opium trade? In the fifty-year period from 1842-1880 opium revenue on average was 15% of India‟s total revenue, which is significant for a single commodity. I'm interested in the earlier period of Opium trade. I have poked around, but haven't seen any quantitative estimates of how big the Opium trade was relative to the total economy of British Empire. Edit: By "total economy of the British Empire" I mean something similar to the GDP of all the economic activity in India, England, Ireland, Wales, Scotland, Gibraltar, Australia, Burma, Canada, Jamaica, etc. All the economic area under the crown, if you will. 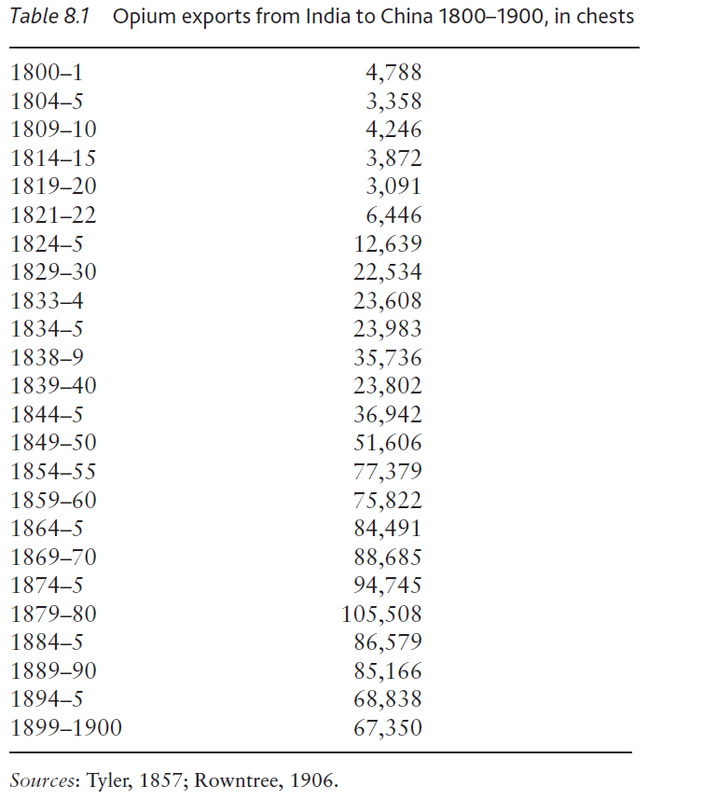 In this chart it looks like in 1870 50% of the British economy was India, and 40% was UK. The correct answer will have as chart element like this for the whole British Empire in the 1820s, with a % for "opium"
There is no doubt that opium and tea formed a "commercial nexus" that became an essential element of the British imperial economy. Although the British government wasn't directly involved in the opium trade, import duties on tea provided 10% of British tax income. Sales of opium generated about one seventh of the revenues of the British East India Company in India [Robins, 2012, p156], and those revenues were used to pay for the tea that was sent back to Britain. As you can see, the opium exports over the period that you are interested in, while nowhere near their peak, were nevertheless substantial. "accounted for 40% of the total value of Indian exports [of the Honourable East India Company]"
The figure for 1825 was approximately half that exported in 1939, so it seems unlikely that it would have amounted to 50% of the Honourable East India Company's profits (never mind the profits of the British Empire as a whole!). most of the money needed to buy tea in China was raised by the illegal opium trade. This will help us estimate the contribution of the opium trade to the GDP of the British empire. If you are interested in exact figures for the trade between India and China at that time, the UK government published a series of papers titled "Papers Relating to the Trade with India and China: Including Information Respecting the Consumption, Prices, &c. in Foreign Countries" in 1829 which should include the detail you're after. For the British Empire as a whole at this period, the 1833 book Taxation, Revenue, Expenditure, Power, Statistics, and Debt of the Whole British Empire; Their Origin, Progress, and Present State by Antonio Pebrer provides valuable details. Happily, this particular volume has been scanned and made available from Archive.org. The East India Company Act 1813 opened up trade with India, but reserved commerce with China to the Honourable East India Company. The quantity of tea exported from the port of Canton by the East India Company in 1825/26 was 27,821,121 lbs. That was valued at £1,729,949 [Papers Relating to the Trade with India and China, p 47]. Since we already know that most of the money needed to buy tea in China in 1825 was raised by the illegal opium trade (see above), this also gives us a rough figure for the East India Company's revenue from the opium trade. If we assume a roughly linear growth in GDP, then, based on the estimates above, the GDP of the British Empire in 1825 would have been something between £316 million and £420 million. Assuming the mean value of £360 million, then the value of the opium trade was just under 0.5% of the GDP of the British empire in 1825. To provide some further context for these figures, the value of exported cotton in 1825 was £30,155,901, which generated a tax revenue of £2,040,718 [Pebrer, 1833, p341]. Trade with British West Indian colonies in 1831 was valued at just over £18.5 million [ibid, p396]. African commerce was valued at just over £1 million [ibid, p419], and trade with "all places eastward of Cape Hope (except CHINA)" was some £10.9 million [ibid, p457]. The estimated total capital of the British empire in 1833 was estimated to be £3,679,500,000 [Pablo, 1833]. At that time, the East India Company was valued at £41,484,354. If anyone feels inclined, most of the the figures required to generate a table - as requested in the later edit to the question - should be available in the sources listed below. Veverka, Jindrich: “The Growth of Government Expenditure in the United Kingdom since 1790.”, in Scottish Journal of Political Economy, 10 (February, 1963), pp 111-127. Not the answer you're looking for? Browse other questions tagged india china british-empire industrial-revolution drugs or ask your own question. What was the impetus behind the British Empire's acquisition of what is now Canada? What was Ghulam Ahmad's relationship with the British authorities in India? Why was Calcutta a node in the opium smuggling network prior to the Opium Wars in China? What percentage of British people during the industrial revolution were rich?